Welcome to A One Korean Painting. 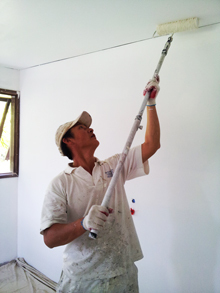 We are the Leading Painters in Chatswood. You can rely on us for quality interior and exterior painting services for your residential and commercial properties. Our professional painters have excellent customer service ratings because each member of our team believes in providing a service that goes beyond the client’s expectations in every aspect. To do this, we establish open communication with our clients and address their concerns even before we start painting. We take your thoughts and ideas into consideration to ensure that you get what you want exactly. Our priority is to ensure that we meet the highest quality and industry standards in our every project. We achieve this by working closely with our clients to ensure that what they have envisioned for their property will become a reality. Take advantage of the best, a professional and reliable local painters in Chatswood. When you are looking for exterior painters Chatswood, you can trust A One Korean Painting for exceptional exterior painting services. Our team will not compromise quality under any circumstance. We follow a standardized and details painting processes to make sure that your exterior painting will last long even under extreme weather conditions. Your goal is our goal. We make sure that you will have quality and consistency in your exterior painting projects. Your home is an essential space for you and your family. As such our residential painters Chatswood works diligently and in the highest standards once you hire us to paint your home. We are not disruptive, operates quietly and clean up thoroughly after completing the job. From surface preparation to final staining and painting, you can expect nothing but superior workmanship. An image is essential for a healthy business. The impression you create is a form of company advertising. Your building represents your business, and it should be clean and well-kept all the time. The right color scheme and clean painting job is an essential part of your image. Don’t leave this job to a mediocre painter. Hire a professional commercial painters Chatswood today. You can schedule our painting job to prevent disruption to your company’s operation. We guarantee impressive results that are delivered on time. Once you engage our services, we ensure that you enjoy a stress-free experience. We make sure that we will not disrupt the normal routines in your everyday lives. Are you Searching for Top Painting Services in Chatswood? Relax and call the professionals at A One Korean Painting. We understand that your painting needs and hopes are different for each home and business owners. Call us now at 0450 661 598!